The medical technology industry is an eminent part of the healthcare sector. It includes, most of all, medical devices which simplify the prevention, diagnosis and treatment of diseases and illnesses. The most well known medical technology products are, among others, pacemakers, imaging instruments, dialysis machines and implants. The whole global medical technology industry’s market size stands at some 430 billion U.S. dollars. Established centers of this industry include the United States and Western Europe. But industry trends show that Asia and first of all China, are about to play a more prominent role in the years to come. Most of the top medical technology companies come from the United States. Some are only divisions of larger companies, like global leader Johnson & Johnson Medical Devices & Diagnostics, or General Electric Healthcare. In 2017, Johnson & Johnson made nearly 27 billion U.S. dollars through its medtech division, and thus was the top U.S.-based company. Although medtech revenues kept increasing over the last years, the financial crisis had a negative impact on the industry. This can be shown by reference to the number of IPOs, which after the crisis was distinctly lower than before it. However, starting with 2013, a strong upward trend is visible throughout the industry's IPO activity. The strongest businesses within the medtech industry are in vitro diagnostics (IVD), cardiology, diagnostic imaging, and orthopedics. In vitro diagnostics currently generate some 53 billion U.S. dollars globally, but are forecasted to reach some 80 billion dollars by 2024. Swiss-based pharmaceutical company Roche is the global top manufacturer, generating about 10.3 billion U.S. dollars in worldwide IVD revenue in 2017. However, it is expected that Roche's share of the global in vitro diagnostics market will decrease from 19.5 percent in 2017 to around 17.8 percent in 2024. Robot-assisted surgery and surgical robots clearly show how far development in medical technology has come. The implementation of artificial intelligence (AI) in this sector is crucial, showing huge potential for more precise and cost efficient surgical procedures. The global market for surgical robots is estimated to reach nearly 13 billion U.S. dollars in 2025. 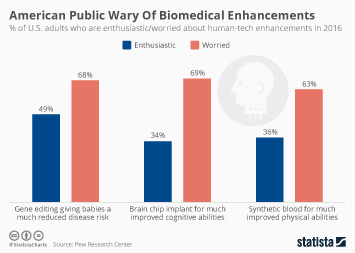 Recent surveys show that large parts of Americans – especially younger generations - already have confidence in surgical robots and would prefer them. Top 50 Companies: Medical Technology in the U.S.